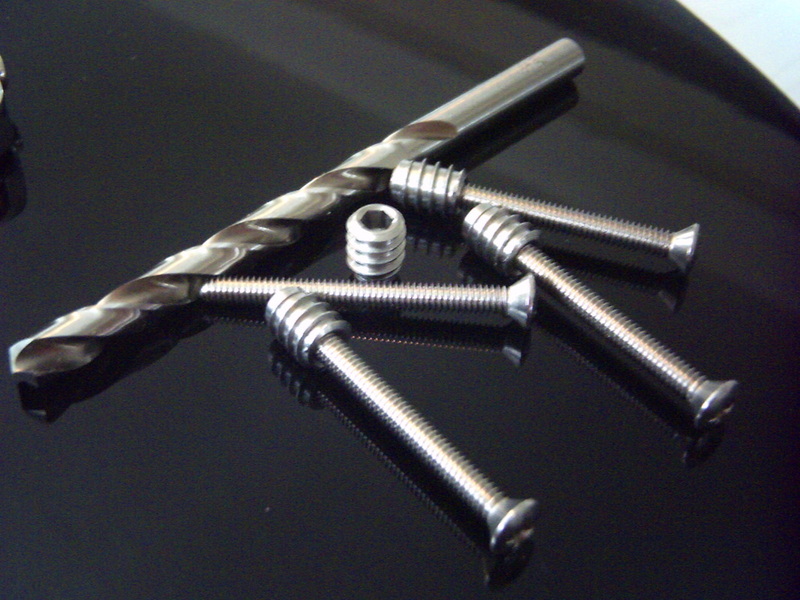 Threaded Guitar Neck Inserts with Stainless Screws as pictured above - we've sold 1000's of these worldwide. Including a detailed 2 page installation guide used by 1000's of people to successfully install these inserts. If you have a Tele, Strat, P Bass, J Bass or any other bolt neck guitar, we’ve put together this kit that will allow you to remove and replace your neck repeatedly, without the risk of stripping the neck screws, additionally, it allows you to clamp the neck much tighter than is possible with the factory wood screws. They’re especially useful on guitars with truss rod adjustment at the heel or if your neck screws have been stripped out. If you look closely you’ll see some important differences between these inserts and others which is why they've become so popular, following the installation guide makes for a trouble and damage free installation of what is typically a tricky job. Included are 8 threaded steel inserts made in Germany, these are extremely precision made with an 8/32 machine tread inside and a continuous specially designed deep flute wood tread outside. These inserts are longer (approx. 1.5 times longer for more thread purchase) and slightly narrower (so you have more wood left between the insert and the edge of the neck), than the ones you usually see used for this purpose. Also included are 8 machine screws - American made stainless steel 8/32 x 1_3/4 inch Oval head – Phillips drive. These stainless machine screws have a much higher tensile strength than the #8 wood screws that come from the factory and will allow you to bolt your neck down that much tighter – they match a Fender screw head exactly (size and shape) and will sit perfectly in your existing Fender spec neck plate – once installed they look completely original. These guitar neck inserts are designed specifically for use on wood and therefore have no locktite on the treads. They install with an Allen key (which you supply) in a .250 inch (6.35mm) diameter pre-drilled hole - they have a 5/32 inch (or 4mm – you can use either) hex socket drive at one end, they are different from the type designed to be installed with a slot screwdriver. Shipping to the UK is $9.99USD – contact me for pricing to all other destinations. Note: We are in no way affiliated with FMIC / Fender® and NO Fender® warranty applies.